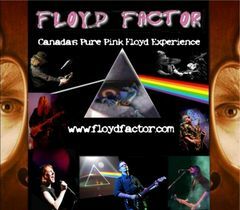 Titan Creative Entertainment is proud to present Toronto-based Floyd Factor; Canada’s premiere multi-media Pink Floyd tribute experience! Developing since 2006, this is a show meticulously designed for the most discriminating Floyd fan, featuring period-era equipment and authentic PF concert visuals. Boasting 5 gifted vocalists, Floyd Factor recreates the voices of Gilmour & Waters with stunning accuracy and delivers all the vocal harmonies so often missing from other Floyd shows. Their instrumental performances are equally jaw-dropping. Having wowed audiences in Ontario & Quebec in 2007, the band’s live (YouTube) videos have garnered much attention from Floyd fans around the globe, who have proclaimed Floyd Factor comparable in quality to the internationally touring Australian PF Show. Q107-FM’s Ryan Parker called the FF show, “Amazing. The Best Pink Floyd band in Canada.” This show succeeds where so many others have failed in recreating PF’s music note for note.